The Detroit Lions and Dallas Cowboys will play in their annual respective Thanksgiving Day games in Week 13 of the 2014 NFL season. With only a month to go before the playoffs begin, office pools everywhere are entering the home stretch. You can run your office pool with our printable NFL Pick Em Week 13 sheets. They are instantly downloadable and complimentary right here at Printablebrackets.net. NFL football has almost become as synonymous with Thanksgiving Day as turkey, family and friends. No team has played more on Turkey Day than the Detroit Lions. In fact, in 2014 the Lions will be playing for the 75th time on Thanksgiving Day. This year, the Lions will host Jay Cutler and the rival Chicago Bears. The Cowboys playing on Thanksgiving Day has also been a tradition since 1966. In one of the most memorable regular season games ever played, the Cowboys suffered a 16-14 loss to the Miami Dolphins in the snow on Thanksgiving Day in 1993. This year, the Cowboys will host the NFC East rival Philadelphia Eagles. In the Thanksgiving nightcap, the San Francisco 49ers will invade Seattle to clash with the rival and defending Super Bowl champion Seahawks. 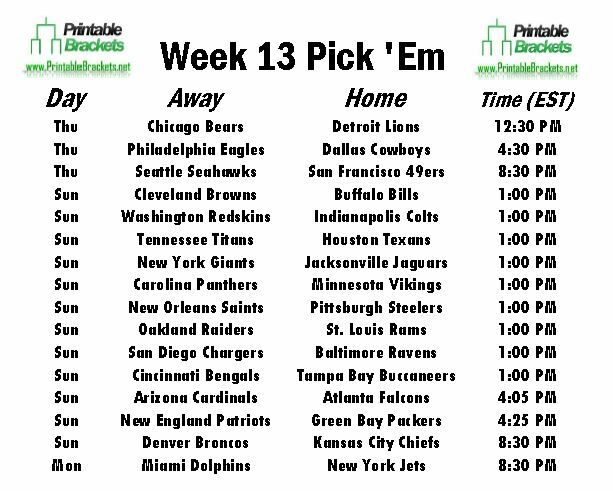 Meanwhile, there are nine early Sunday games on the NFL Pick Em Week 13 sheet. The Indianapolis Colts will clash with the Washington Redskins, while the Pittsburgh Steelers will square off with the New Orleans Saints. In late Sunday action on the NFL pick em Week 13 sheet, Aaron Rodgers and the Green Bay Packers will welcome Tom Brady and the New England Patriots, while the Arizona Cardinals will face the Atlanta Falcons. Sunday’s schedule wraps up with the Kansas City Chiefs hosting the Denver Broncos, while the Miami Dolphins and the New York Jets will renew pleasantries on “Monday Night Football”.